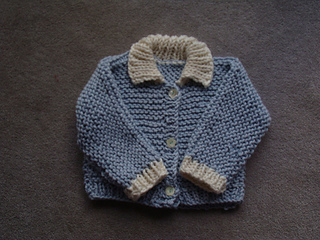 You’ll keep a child cozy with more than hugs when you make this sweater. Knit in a super bulky yarn, it’s a quick knit - and a toasty warm one, too! It’s an easy and wonderful confidence builder for the new knitter. 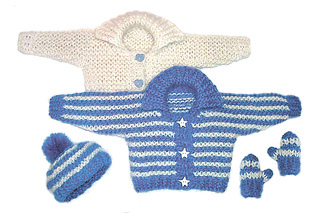 Knit it in stripes for a fun effect or use a solid color and jazz it up with some special buttons. This sweater will give one of your favorite little ones a lot of love - with a little bit of your time and talent! Sweater is knit in one piece with side and underarm seams. Gauge is over garter stitch. This pattern includes sweater, hat, and mittens. Yardage listed above is for sweater only. Instructions are for stripes or solid.